The Kvant module was the first addition to the Mir core. The module is divided into a pressurised laboratory compartment and a non-pressurised equipment compartment. The laboratory compartment is further divided into an instrumentation area and a living area, which are separated by an interior partition. Russian manned space station module. Kvant 1). 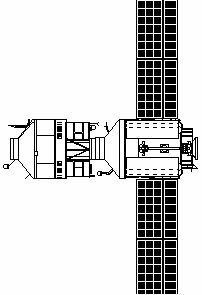 The Kvant spacecraft represented the first use of a new kind of Soviet space station module, designated 37K. Launched 1987. AKA: 11F37;37KE;TsM-E 37Ke-010. Status: Operational 1987. First Launch: 1987-03-31. Last Launch: 1987-03-31. Number: 2 . Payload: 4,100 kg (9,000 lb). Gross mass: 18,500 kg (40,700 lb). Unfuelled mass: 13,500 kg (29,700 lb). Height: 13.00 m (42.00 ft). Span: 4.20 m (13.70 ft). 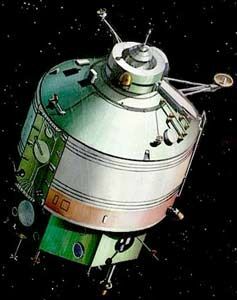 The 37KE was designated Kvant and was equipped with an astrophysics payload. It also used the Salyut-5B digital flight control computer and Gyrodyne flywheel orientation system developed for Almaz. As the module neared completion Salyut 7 experienced numerous technical problems and Kvant was retargeted for a docking with Mir. But at that time Mir was planned to be in a 65 degree orbit, and Kvant was 800 kg too heavy for the Proton launch vehicle to place in such an orbit. In January 1985 Mir was changed to a 51.6 degree orbit, which solved one problem. But now it was planned that Kvant would dock with the rear port of Mir, requiring the addition of lines to conduct rocket propellant from Progress tanker spacecraft to Mir's storage tanks. This increased weigh again, forcing the FGB to have it's propellant load reduced to 60% in the high pressure tanks and empty low pressure tanks. Still, at 22,797 kg, Kvant was the heaviest payload ever lofted by Proton, requiring special custom modifications to its launch vehicle. Kvant was originally to be launched in late 1986 but problems with its scientific payload resulted in it spending 14 months at the spacecraft integration hall at Korolev. 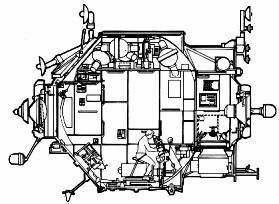 Software development delays with the Salyut-5B resulted in it being deleted as well (it was later delivered to Mir with the Kvant-2 module). Finally it was delivered to Baikonur in November 1986. Following a successful launch it managed to dock to Mir on April 12, 1987, on the second attempt after the crew removed a trash bag from the docking collar in a space walk. The FGB tug, its work done, then backed away from the station. But the maneuvers had cut into its already-reduced propellant supply. Unable to deorbit itself to a controlled burn-up in the atmosphere, the FGB was instead commanded to boost itself into a storage orbit 40 km above Mir. From there its orbit decayed until it made an uncontrolled re-entry on 25 August 1988. 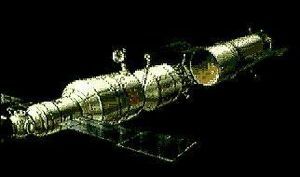 Kvant itself remained attached to the Mir station throughout its long life. Kvant successfully operated until fall 1989, at which time operation was stopped for a planned reconfiguration of the Mir station. Kvant was restarted in October 1990 with calibration observations showing no apparent degradation from the year off. Attitude control thrusters were added to one of the external masts mounted by cosmonauts in 1992 to reduce fuel consumption of pointing maneuvers. One solar array wing from the Kristal module was transferred to Kvant in 1992. Two new solar arrays (12 kW total) were delivered in 1995 to replace Kristal array. Most of Kvant's instruments had failed by the mid-1990's and by then it was used mainly for rubbish storage. The Kvant ('Quantum') module was the first addition to the Mir base block and contained scientific instruments for astrophysical observations and materials science experiments. Kvant conducted research into the physics of active galaxies, quasars and neutron stars. The module also supported biotechnology experiments in anti-viral preparations and fractions. The module was divided into a pressurized laboratory compartment (40 cubic meters total pressurized volume) and a non-pressurized equipment compartment. The laboratory compartment was further divided into an instrumentation area and a living area, which were separated by an interior partition. A pressurized transfer compartment connected the Mir base block with the laboratory compartment. The unpressurised equipment compartment contained power stabilizers. 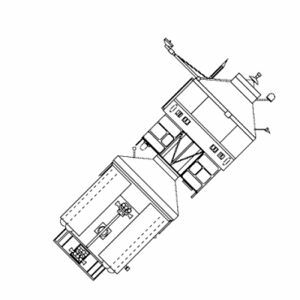 In addition to its primary scientific equipment, the module also carried Gyrodyne flywheel gyrostabilizers designed orient the station without use of propellant. Two external masts, erected by cosmonauts on the outside of Kvant, were used for a variety of experiments. Two Earth horizon sensors, two star sensors, and three star trackers were used for attitude knowledge. TTM Coded Mask Imaging Spectrometer - a wide-angle camera that used a coded aperture mask to determine source location. It covered the energy range 2-30 keV with a 7.8 deg x 7.8 deg field of view. It could achieve an angular resolution of 2 arcminutes and a time resolution of 1 sec. Provided by the Netherlands/UK. HEXE (High Energy X-ray Experiment) - Four detectors that covered the 15-200 keV energy range. The instrument had a 1.6 x1.6 deg field of view and has a maximum time resolution was 0.3-25 ms. Provided by West Germany. Sirene 2 Gas Scintillation Proportional Spectrometer - a gas scintillation proportional counter that covered the 2-100 keV energy range. It had a 3 x 3 deg field of view with a maximum time resolution of 1.25-2.5 ms. Provided by ESA. Pulsar X-1 - 4 Phoswich detectors that covered the 20-1300 keV energy range. It had a 3 x 3 deg field of view with a maximum time resolution of 10 s. Provided by the USSR. Glazar UV Spectrometer - covered wavelengths between 1150-1350 angstrom. The instrument could provide up to 1-2 angstrom resolution and had a 1.3 deg FOV. Mariya magnetic spectrometer - measured high-energy electron and positron fluxes in near-Earth space. Arfa-E - installed on the exterior of the module in January 1990 to investigate the Earth's ionosphere and magnetosphere by injecting electron beams perpendicular to the geomagnetic field. Habitable Volume: 40.00 m3. Electric System: 6.90 average kW. Family: Soviet Space Stations, Space station, Space station orbit. Country: Russia. Engines: KRD-442. 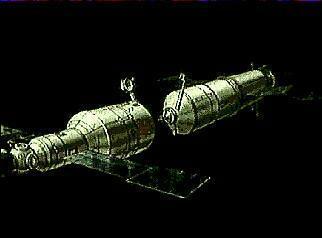 Spacecraft: Mir, Mir complex, Kvant FGB, Kvant AM. Launch Vehicles: Proton, Proton-K. Launch Sites: Baikonur, Baikonur LC200/39. Agency: Chelomei bureau, MOM. Bibliography: 182, 2, 20, 274, 279, 453, 6, 67, 8. Cutaway of Kvant illustrating service module that separated after docking with Mir. 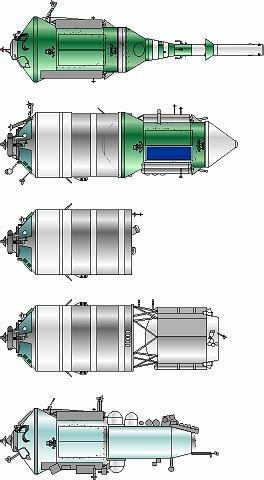 Competing concepts for Mir space station modules. From top: Chelomei's TKS module from Almaz, consisting of the FGB tug, VA re-entry capsule, and abort rocket; 37K Kvant laboratory module, with FGB tug as used to dock with aft port of Mir; 37K Kvant laboratory after docking; NPO Energia design for follow-on 37K modules (cancelled); FGB-derived modules actually used. 1979 September 17 - . 37K space station module authorised - . Nation: Russia. Spacecraft: 37KB, 37K-Mir, 37KS, Kvant, LO, NPG. The basic 37K design consisted of a 4.2 m diameter pressurised cylinder with a docking port at the forward end. It was not equipped with its own propulsion system. The original authorisation was for a total of eight 37K's of various configurations. Of these, only the 37K-E (Kvant module of Mir) and the 37KS (instrumentation module in Buran) would fly. 1985 During the Year - . Mir planned orbit changed to 51.6 degree inclination - . Nation: Russia. Spacecraft Bus: 37K. Spacecraft: Kvant. 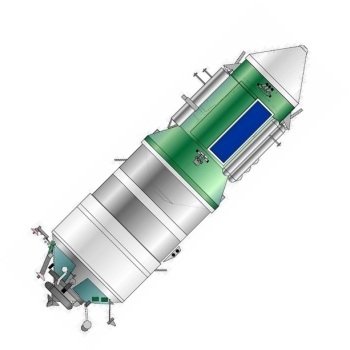 This change was made at least partially due to weight growth in the add-on modules, which had become too heavy for the standard Proton launch vehicle..
Kvant module delivered to Baikonur - . Nation: Russia. Flight: Soyuz TM-2. Spacecraft Bus: 37K. Spacecraft: Kvant. Kvant was originally to be launched in late 1986 but problems with its scientific payload resulted in it spending 14 months (versus 5 planned!) at the spacecraft integration hall at Korolev..
1987 March 31 - . 00:16 GMT - . Launch Site: Baikonur. Launch Complex: Baikonur LC200/39. LV Family: Proton. Launch Vehicle: Proton-K.
Kvant 1 - . Payload: 37KE s/n 010 / 77KE s/n 16601. Mass: 20,000 kg (44,000 lb). Nation: Russia. Agency: MOM. Program: Mir. Class: Manned. Type: Manned space station. Flight: Soyuz TM-2, Soyuz TM-2 Mir LD-1. Spacecraft Bus: 37K. Spacecraft: Kvant. Duration: 2,586.99 days. Decay Date: 2001-03-23 . USAF Sat Cat: 17845 . COSPAR: 1987-030A. Apogee: 393 km (244 mi). Perigee: 385 km (239 mi). Inclination: 51.60 deg. Period: 92.30 min. Officially: Extra-atmospheric astronomic research and resolution of a number of problems with scientific and economic applications. FSB - . Payload: FSB No. 16601. Mass: 18,500 kg (40,700 lb). Nation: Russia. Agency: MOM. Program: Mir. Flight: Soyuz TM-2, Soyuz TM-2 Mir LD-1. Spacecraft Bus: 37K. Spacecraft: Kvant. Decay Date: 1988-08-25 . USAF Sat Cat: 17851 . COSPAR: 1987-030C. Apogee: 404 km (251 mi). Perigee: 380 km (230 mi). Inclination: 51.60 deg. Period: 92.40 min. 1987 April 12 - . Kvant docks to Mir - . Nation: Russia. Flight: Soyuz TM-2. Spacecraft Bus: 37K. Spacecraft: Kvant. It managed to dock to Mir on the third attempt after the crew removed a trash bag from the docking collar in a space walk. The FGB tug, its work done, then backed away from the station. But the manoeuvres had cut into its already-reduced propellant supply. Unable to deorbit itself to a controlled burn-up in the atmosphere, the FGB was instead commanded to boost itself into a storage orbit 40 km above Mir. 1988 August 25 - . Kvant FGB Tug re-enters - . Nation: Russia. Flight: Soyuz TM-4. Spacecraft Bus: 37K. Spacecraft: Kvant. The FGB tug's multiple docking manoeuvres in April 1987 had cut into its already-reduced propellant supply. Unable to deorbit itself to a controlled burn-up in the atmosphere, the FGB was instead commanded to boost itself into a storage orbit 40 km above Mir. From there its orbit decayed until it made an uncontrolled re-entry.